Thieboudienn (ceebu Jen) is the Senegalese Rice and fish, it is also known as Riz gras in Cote d’Ivoire, Guinea and other countries in West Africa , in Nigeria and Ghana a similar recipe is called Jollof Rice. The recipe is made from rice, fish, tomato sauce and some other vegetables. Optional: 1 sweet cassava, 1 sweet potato and some smoked fish. You can use Senegalese broken rice or Jasmine rice. To make your rice easier to cook, soak it in hot water for 20 minutes and wash several times with cool water. Wash the fishes and divide them into medium pieces. Then mix the parsley with half of the garlic, some ground hot pepper, add some salt and half of a bouillon cube. Mixing the stuffing can be done in a mortar and pestle or by using a food processor. By using a knife, make some hole in each fish, and then insert the stuffing into the holes. Step 2: Making the tomato sauce. In a large cooking pot, heat the oil and add onions, tomatoes, tomato paste, garlic and black pepper. Stir -fry for about 15 minutes over medium heat. You can then add the fish in tomato sauce. But some people prefer to fry the fish in advance. Personally I do not fry the fish. In the tomato sauce, add one bouillon cube, the bay leaves and 1 cup water. Let that simmer until the fishes are cooked. This may take 15 minutes or less. Remove the fishes from the tomato sauce and set aside. Now add all vegetables in the pot except the okras. Add another cup of water and cook the vegetables until they are all very tender . This may take around 20 to 30 minutes. When the vegetables are done, remove them from pot and set aside. Then add the okra with more water and bring the soup to boil. When the okras are cooked, remove them and add the rice. Cook the rice over low heat, you might need to turn it often so that all sides get cooked. 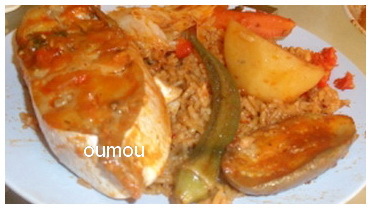 When your Thieboudienn is ready to serve, place the rice in a large dish and arrange the vegetables and fish on top.